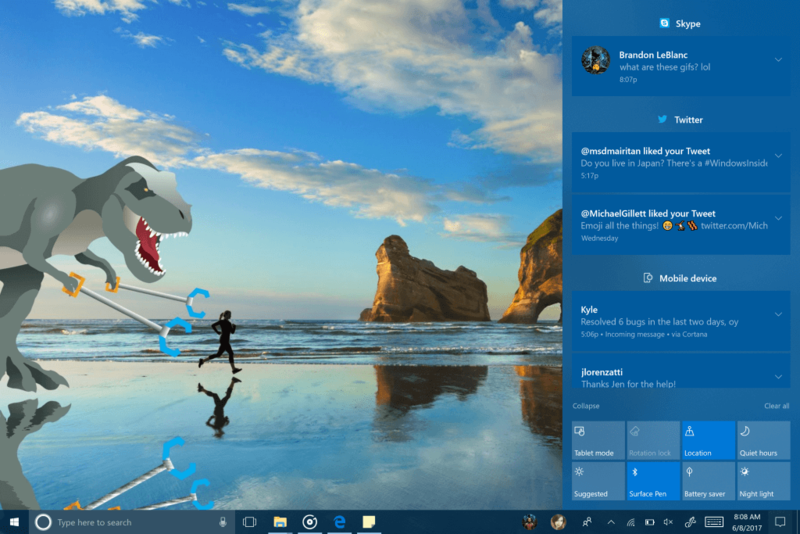 Microsoft today released a new Windows 10 build to Insiders on the Fast Ring, offering an early peek at several improvements and new features that will arrive as part of the Fall Creators Update later this year. The changes cover everything from dictation, predictive typing, Start, Edge, Cortana and a lot more. One of the first things you’ll notice is a new UI for Start and Action Center that includes elements of Microsoft’s Fluent Design System which was announced at Build 2017. Start has been updated to use the new acrylic design and is now better at resizing vertically and horizontally, instead of only snapping to certain sized. Meanwhile, Action Center has been redesigned with separate sections for apps, and now groups notifications together in a more coherent way from devices, apps, and elsewhere. The pinned sites feature is returning after feedback from Windows 10 users. You can pin sites to your Windows taskbar, in much the same way you can pin apps, with an option to “Pin this page to the taskbar” from Edge’s settings menu. This build also introduces a new Full Screen mode which you can switch on or off by pressing F11, it has smoother new tab animations, there are improvements to the browser’s session restore behavior, and new annotation tools for EPUB Books when viewed in Edge. Microsoft’s digital assistant will also see some changes, with the ability to prompt for reminders by scanning new pictures or images from your camera roll for things like events — this requires user permission and for now only works in English. Cortana also has a new lasso feature that lets stylus users circle upcoming event info on an image to create reminders for you. The handwriting panel has been overhauled with more gestures, better editing, emoji, and automatic handwriting detection. A new conversion and overflow model makes it so that when filling the handwriting panel and lifting the pen off the screen, words will be converted into typed text and shift to the left so users have room to continue writing. Press the commit button to insert all the text and clear the slate. Users can also select text to edit and make corrections within the handwriting panel by overwriting converted text. Gestures for things like strikethrough, scratch, join, and split are supported. The feature now has better palm rejection, better handwriting recognition in English, and you can set the handwriting panel to float next to where you are writing. Microsoft has even added a “find my pen” option, that will show where you were with your device when you last used the pen. Dictation has been in Windows for years but Microsoft has now added a microphone button in a new touch keyboard for Windows 10 desktop and tablet users, so you can either tap that icon or press Win + H to dictate text or speak basic editing commands — things like “delete last three words,” “clear selection,” “go to the end of paragraph”. Microsoft lists dozens of other changes to Windows 10 overall, like a new winkey + period / semicolon keyboard shortcut will trigger a new emoji panel, with prediction, emoji suggestions, one-handed input. There’s improved support for HDR monitors, a new Share feature, Night Light improvements, and a new per app defaults settings pane. There’s a long list of other minor changes and fixes listed in Microsoft's blog post here.